ISTANBUL (Reuters) – Turkey has given recordings related to the killing of Jamal Khashoggi to Germany, France and Britain, President Tayyip Erdogan said on Saturday, seeking to maintain international pressure on Riyadh over the Saudi journalist’s death. Khashoggi, a critic of de facto Saudi ruler Prince Mohammed bin Salman, was killed in Saudi Arabia’s Istanbul consulate last month in a hit which Erdogan says was ordered at the “highest levels” of the Saudi government. His killing provoked global outrage but little concrete action by world powers against Saudi Arabia, the world’s largest oil exporter and a supporter of Washington’s plans to contain Iranian influence across the Middle East. Speaking as he left Turkey to attend World War One commemorations in France which are being attended by President Donald Trump and European leaders, Erdogan said for the first time that the three European Union states had heard the recordings. “We gave the tapes. We gave them to Saudi Arabia, to the United States, Germans, French and British, all of them. They have listened to all the conversations in them. They know,” Erdogan said. CIA director Gina Haspel heard an audio recording of Khashoggi’s death when she visited Istanbul, two sources told Reuters last month. A senior Saudi envoy was also played a recording, a source familiar with the matter said. Erdogan did not give details of the contents of the tapes on Saturday but two sources with knowledge of the issue have told Reuters that Turkey has several audio recordings. They include the killing itself and conversations pre-dating the operation which Turkey subsequently uncovered, the sources said. These had led Ankara to conclude from an early stage that the killing was premeditated, despite Saudi Arabia’s initial denials of any knowledge or involvement. Saudi Arabia’s prosecutor Saud al-Mojeb has since said Khashoggi’s killing was planned in advance, although another Saudi official said Prince Mohammed had no knowledge of the specific operation. 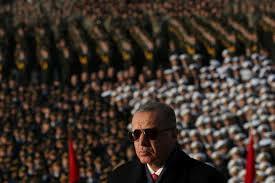 Erdogan did not repeat on Saturday his accusation that the operation was ordered by Saudi leaders. However, he called on Riyadh to identify the killer, saying it must have been a member of a team that arrived in Turkey hours before Khashoggi’s disappearance. “There’s no need to distort this issue, they know for certain that the killer, or the killers, is among these 15 people. Saudi Arabia’s government can disclose this by making these 15 people talk,” Erdogan said. Erdogan also accused Mojeb – who visited Istanbul to discuss the investigation with his Turkish counterpart and inspect the Istanbul consulate – of refusing to cooperate. “The prosecutor came to Turkey to make excuses, make things difficult,” he said. Erdogan repeated a demand for information on the whereabouts of Khashoggi’s body. An adviser to the president has said the body was cut up for disposal, and Vice President Fuat Oktay has called for an investigation into reports that it was then dissolved in acid. A Turkish official said last week that Saudi Arabia sent two people, a chemist and a toxicologist, to Istanbul a week after Khashoggi’s Oct. 2 killing to erase evidence, calling it a sign that top Saudi officials knew of the crime. Saudi Arabia has said members of the team which was sent to Istanbul, and returned shortly after the killing, have been arrested along with three others. Following a meeting on Saturday in Paris, Trump and French President Emmanuel Macron agreed that Saudi authorities needed to shed full light on Khashoggi’s murder, a French presidency source said. They also agreed that the matter should not be allowed to cause further destabilisation in the Middle East and that it could create an opportunity to find a political resolution to the war in Yemen, according to the official.